The principle behind the development of the Coloroid system was to produce a system which adequately described all the relations of the coloured environment and as such would be primarily of use in environmental colour design. Additionally, a simple correlation between the Coloroid and CIE systems was required which would enable conversion between the two systems. The Coloroid system is designed to represent equality of aesthetic spacing and as such is an aesthetically uniform spacing in which the Coloroid hue, saturation and lightness scales appear to change uniformly along their entire length when the scales are viewed in their entirety. Aesthetically uniform space differs from perceptually uniform space in that emphasis is placed on the evenness of appearance of the whole colour space and not on equal intervals of small colour differences. Thus the Coloroid system is an attempt at producing global visual uniformity and not localised uniformity. The Coloroid hue, saturation and lightness scales are designed to be aesthetically even psychometric scales, and as such the scales are produced from statistical evaluation of the results obtained from a number of individual observations of colour scales. 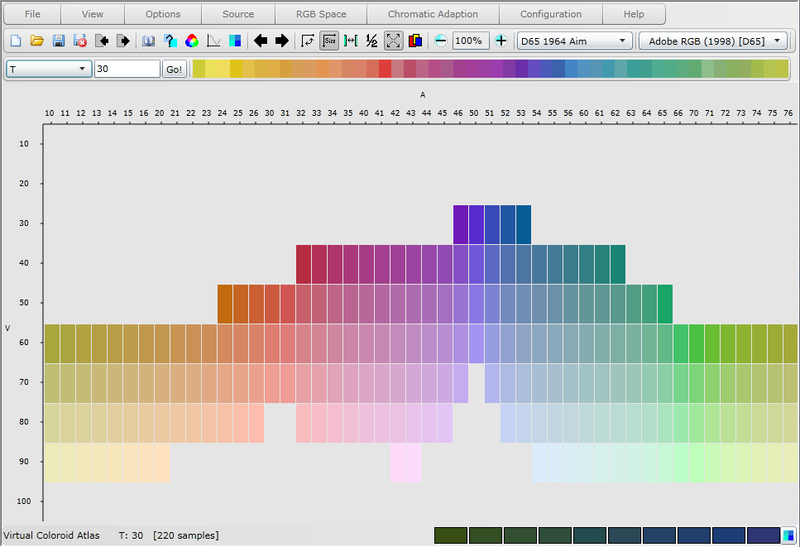 From experimentation the dominant wavelength for 48 uniformly spaced Coloroid hues were determined. Attempts at determining a mathematical expression which defined this relationship were unsuccessful so the calculation of the dominant wavelength of hues between the 48 defined hues is by interpolation. These 48 hues are the Coloroid basic hues and are denoted by the integers 10 to 16, 20 to 26, 30 to 35, 40 to 46, 50 to 56, 60 to 66 and 70 to 76. 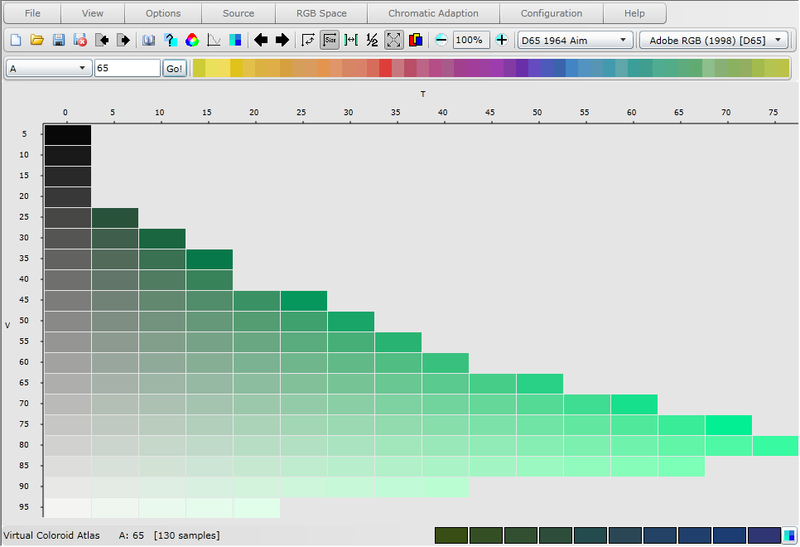 All possible hues are encompassed in the Coloroid hue scale and are expressed as decimal fractions of the basic hues. 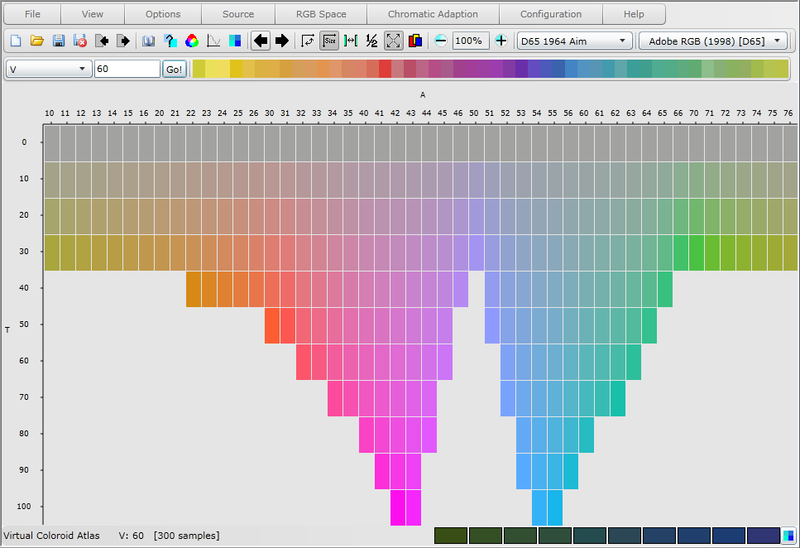 The hue scale is denoted by the letter A, where 10 <= A < 17, 20 <= A < 27, 30 <= A < 36, 40 <= A < 47, 50 <= A < 57, 60 <= A < 67 and 70 <= A < 77, and the hue scale forms a closed circle such that A = 10 and A = 77 are identical. Coloroid saturation is defined as the percentage content of the limit colour and extends from T = 0, the achromatic colours on the central axis, to T = 100, the fully saturated colours on the surface of Coloroid colour space in 100 aesthetically even steps. Colours of constant Coloroid saturation are parallel to the central axis. The central axis of Coloroid colour space is the Coloroid lightness scale which extends from V = 0, absolute black, to V = 100, absolute white, in 100 aesthetically even steps. Colours of constant Coloroid lightness are on horizontal planes through Coloroid colour space. The Coloroid lightness and saturation scales are thus perpendicular to each other, with Coloroid lightness increasing vertically and Coloroid saturation increasing horizontally away from the central axis. A colour is thus uniquely identified in Coloroid colour space in coordinates of hue, saturation and lightness, expressed in Coloroid notation as A-T-V. Coloroid colour space is thus three-dimensional and the Coloroid coordinates are based on a cylindrical coordinate system. Coloroid hue varies around the surface of the cylinder, the hues themselves are the lines starting from the coordinates of the illuminant (A, C or D65) on the 1931 CIE chromaticity diagram and terminating at the spectral curve or the line joining the colours of 450nm and 625nm wavelength. This line is roughly parallel to the purple line on the CIE 1931 chromaticity diagram which joins the colours of 380nm and 700nm wavelength. Thus Coloroid colour space does not contain all possible colours, the missing colours are bounded on the CIE 1931 chromaticity diagram by the arc of the spectral curve between 380nm and 460nm, the line from 460nm to 620nm, the arc of the spectral curve between 620nm and 700nm and the line joining 700nm to 380nm. These colours are the highly saturated reds, purples and violets. As Coloroid saturation is dependent on the sum of the CIE tristimulus values of the most highly saturated colour on a hue - the Coloroid limit colour - the low tristimulus values of the colours on the purple line would have caused a deficiency of highly saturated colours. Every colour in the Coloroid system is regarded as an additive mixture of the specific limit colour for a hue, together with absolute white and absolute black. The sum of the percentage mixture of the limit colour, absolute black and absolute white, for any colour in Coloroid colour space, when divided by 100 is always unity.